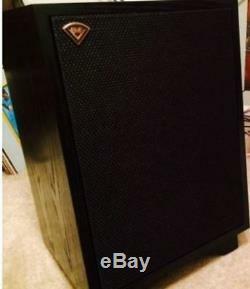 KLIPSCH HERESY III BLACK Floor standing speakers. The picture is only for reference! The Heresy is a compact, three-way design that uses horn-loaded compression drivers for midrange and treble reproduction and a direct radiating 12woofer for the low frequencies. 3-Way Design: The Klipsch Heresy III loudspeaker features a three-way design that uses horn-loaded compression drivers for midrange and treble reproduction, plus a direct radiating 12 woofer for the low frequencies. 1" Tweeter (w/ Tractrix Horn): The 1" (K-107-TI) titanium diaphragm compression driver is coupled to a Tractrix Horn for smoother high-end response with greater extension, enhanced imaging, and more powerful dynamics. 1.75" Midrange (w/ Exponential Horn): The 1.75" (K-53-TI) titanium diaphragm compression driver is coupled with an Exponential Horn for detailed, accurate midrange sound. 12" Woofer: The 12" (K-28-E) fiber-composite cone woofer delivers powerful low frequencies. The 12 woofer also employs a treated cloth surround for added efficiency and flexibility. Crossover Network: For signal purity and perfect driver integration, the crossover (HF: 5500Hz/MF: 850Hz) on the Heresy III features the finest components and Klipsch custom internal wiring. MDF Enclosure: The Klipsch Heresy III loudspeaker employs a solid, inert MDF cabinet which minimizes panel vibrations that can color sound. The acoustic suspension (sealed) design lends itself to the speaker's accurate, natural sound reproduction. The Heresy III is available in a high-quality cherry, blonde cherry, walnut, or black ash real-wood veneer finish. Dual Binding Post Speaker Terminals: The Klipsch Heresy III loudspeaker has two sets of binding posts connected by jumpers. Using the dual binding posts, you can bi-amp or bi-wire the speakers. The binding post terminals will accept banana plugs (single/dual), pin-connectors, spade-connectors, and bare wire. Placement: The Klipsch Heresy III loudspeaker will perform well in a variety of locations. Corner, floor placement will deliver the highest degree of low bass reinforcement and the pre-installed slant riser base helps to compensate for the Heresy's short stature. This riser may be removed for shelf or cabinet placement. Self-stick rubber pads are supplied for attachment to the bottom of the cabinet to prevent scratching of shelves and hard surfaces. Best results will be achieved using the following general guidelines. Place on a common wall 6' to 15' apart and position them equidistant from the wall behind the speakers. Angle speakers toward the listener and even with or forward of any adjacent obstructions. Placing them near a corner or wall provides the greatest amount of bass while moving the speakers away from room boundaries reduces bass. Asymmetrical placement of a pair of speakers from adjacent side walls can smooth room-induced bass unevenness. Note: Experiment with the above guidelines to suit your taste and to compensate for your room's acoustic characteristics. Heritage Series (Made in the USA): The Klipsch Heritage Series is built and handmade in the USA at Klipsch's manufacturing facility in Hope Arkansas. Each Heritage Series loudspeaker utilizes Klipsch proprietary horn-loaded technology to bring a live music listening experience into the home. All Heritage Series loudspeakers are available in a variety high-quality wood veneers. Klipsch believed four principles to be the foundation for great sound. They continue to drive the design of every new Klipsch speaker, today and tomorrow. High Efficiency & Low Distortion: Klipsch horn technology is highly efficient, providing more accurate sound with less power and less distortion - resulting in louder, cleaner audio. Klipsch's Law: Efficiency is inversely proportional to distortion. Controlled Directivity: Klipsch horn technology accurately directs sound to the proper locations, which, in turn, creates a more lifelike soundstage without wasting acoustic energy where sound is not needed or desired. Wide Dynamic Range: The softest sounds are reproduced with remarkable clarity and the loudest sounds are delivered without harshness or distortion - with the greatest possible range between the softest and loudest sounds. Flat Frequency Response: Audio is delivered without frequency bias - no unnatural highs, mids or lows - reproducing recorded sound as accurately as possible without colorization. Frequency Response 58-20k Hz Sensitivity 99 dB Impedance (Ohms) 8 Subwoofer Amp Power --- Height (inches) 23-7/8 Width (inches) 15-1/2 Depth (inches) 13-7/16 Weight 44 lbs. The item "PAIR FLOOR STANDING SPEAKERS KLIPSCH HERESY III BRAND NEW! WARRANTY BLACK" is in sale since Sunday, January 20, 2019. This item is in the category "Sound & Vision\Home Audio & HiFi Separates\Speakers & Subwoofers". The seller is "hifiexperience" and is located in F - D - GB - I - NL DETAILS IN SHIPPING. This item can be shipped to all countries in Europe, Australia, United States, Canada, Brazil, Japan, New Zealand, China, Israel, Hong Kong, Indonesia, Malaysia, Mexico, Singapore, South Korea, Taiwan, Thailand.